When your gutters or downpipes are clogged, call our company right away and book our professional and unequalled gutter cleaning service. Our gardeners are unrivalled in their work and we can assure you that no matter how high, what kind of gutters you have, or how much debris are clogging them, our expert gardeners will efficiently unclog them and clean them. 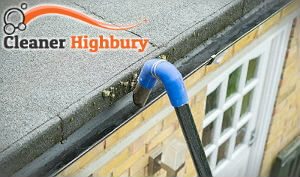 Our gutter cleaning service is notorious in Highbury and we would love to help you like we help many other people in town. Our gardeners have years of experience in gutter cleaning, they are savvy and knowledgeable and will easily clean yours, regardless of their condition. Let our professionals help you get your gutter system and home ready for the upcoming rains. Our gardeners work using special telescopic poles, that they can attach special vacuum cleaners to and efficiently clean the highest gutters and downpipes of your house. They will get rid of the debris and grime that are clogging your gutters and downpipes, and also all fallen leaves, pine needles, pine cones, twigs, etc. After our gardeners are done with the cleaning, they will run water through your gutter system to check for any missed debris. And at the end, of course, they will throw out the garbage they have collected from your gutter system. Our gardeners are reliable, prompt, very professional and friendly, and will carry out the job to a high standard. Here in Highbury, N5, our gutter cleaning service is widely used by thousands of people and we do not have a dissatisfied client. 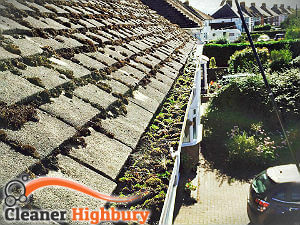 We have been helping people with keeping their gutter systems in perfect conditions for a long time. We know the intricacies in our job and we are always ready to help.